Thank you everyone for a successful 2018 Moke Races! Great photos from some past races: 2018, 2017, 2016, 2014, 2013, 2012, 2011, 2010, 2007, 2006 and a video montage. Questions about running a slalom course, check out our Slalom Course Basics page. What are the Moke Races? 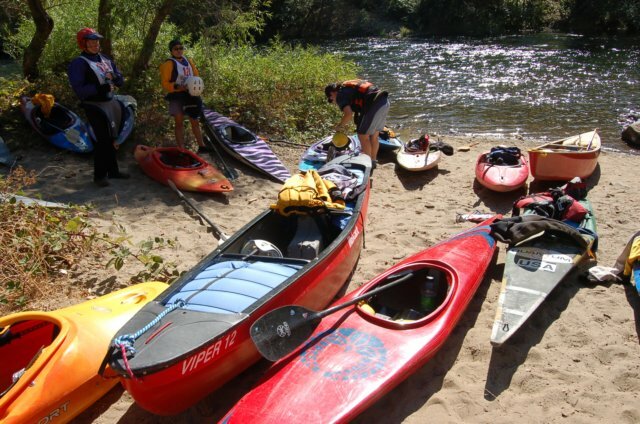 The Mokelumne River Races - also called the Moke races - are a weekend whitewater kayaking event with a three mile downriver sprint, an 18-22 gate slalom race and plenty of slalom course practice time. The races are open to all boaters from novice to expert. It's a fun weekend and great for your paddling skills, no matter what your level. Many boaters use their standard river running or play boats, but you'll also see people in carbon fiber slalom racing boats, whitewater canoes, wildwater downriver race boats, and even Stand-up Paddleboards (SUPs). Even if you're not sure that you're up for racing, watching the races, practicing on the slalom course and lending a hand can be a lot of fun and can give you a taste for what it's all about. Since 1978 the races have been sponsored by the Loma Prieta Paddlers. LPP is an activity section of the Sierra Club and an American Canoe Association Paddle America Club. We are based in the San Jose and San Francisco Bay area. 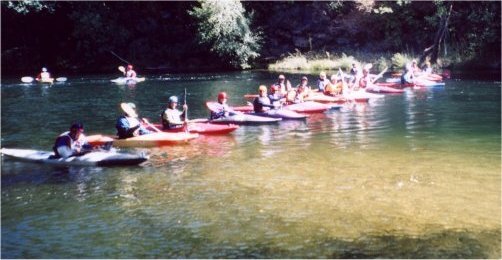 We support the California paddling community through weekly pool roll sessions, a full schedule of river trips and the annual Cache Creek and Mokelumne River Races. Proceeds from the races go to support the club's activities and donations to various river advocacy organizations. Part of the 2011 Race Crowd. The course is set up on a Class II stretch of the Mokelumne River known as the Electra run. It's in California's gold country, just off of Highway 49, south of the gold rush town of Jackson. It's a pretty stretch of river with some nice beaches for swimming, relaxing and fishing when you're not kayaking. It has easy road access, a short stroll up the bank from the river's edge. The Mokelumne is a dam controlled river. PG&E has been a great supporter of the races; delivering consistent flows for race weekend. To get to the races drive approximately 5 miles south of Jackson on Hwy 49. Turn left on Electra Road. This is the last road on the left before Hwy 49 crosses the Mokelumne River. You'll find the race course about 1.5 miles up the road. This road paved, but very narrow, please drive carefully. You must park off of the pavement along Electra road. Parking is always limited so carpooling is recommended. It's about a 2:30 drive from the Bay Area, a bit over an hour from Sacramento, 3 hours from Chico, Fresno or Reno and about 5 hours from Bakersfield. Here's an interactive map of the race course location including points of interest in the area. The slalom course is 18-20 gates spread out over 300 yards of class II whitewater. The course is available all day Saturday for practice and the race takes place on Sunday. If you're unfamiliar with running a slalom course check out our Slalom Course Basics page. Here's a look upstream from about halfway down the course. Your score for each run is your time, in seconds, plus penalties for touching (2 seconds) or missing (50 seconds) a gate. You get two runs down the course and your standing is based on the best of your two runs. You'll see lots of custom slalom boats at the races, but many people choose to practice and race in their everyday whitewater kayak, canoe or IK. The type of boat you choose to paddle and your gender and age determines which class you race in. Racers may participate in a maximum of one K1 event, but may race a combination of K1, C1, C2, OC1, OC2 and IK events. Men's and women's are separate categories and two paddler boats also have a mixed category. If you're paddling in K1 Novice, Intermediate or Expert B and you won your class in a previous year when there were three or more paddlers in that class you must move up to the next class. Here are some thoughts on how running gates in a slalom course can be used to gauge and improve your river paddling. Saturday afternoon we hold the downriver race. Racers paddle as quickly as possible the 3 miles from the starting line at the beach near the Electra powerhouse to the finish near the Highway 49 bridge. Wildwater and slalom boats are started at one minute intervals. The river boat (longer plastic boats), play boat (short plastic boats), canoe, inflatable and SUP classes have a mass start. Most boaters do this run in 20-30 minutes; which is a big change from the two the three hours boaters take when they are playing down this same stretch of river. There is a pre-race meeting at the put-in beach and there is always an assortment of vehicles leaving from around the registration tent to carry racers, their gear and boats to the put-in at Electra beach. Help with this downriver shuttle is always appreciated. The type of boat you choose to paddle and your gender and age determines which class you race in. Since there is only a single downriver race you may only participate in single downriver event. The races usually take place around the third weekend in September. We post the race date for the coming year in early spring as we get confirmation of water availability and dates for other fall paddling events. This is course setup day. Volunteers spend the day pulling lines across the river, climbing trees, tying knots, setting gates and trying out the course. We wrap up the day with potluck BBQ. ~6:00pm to ??? Potluck & BBQ at a location TBD. We'll have a grill and tables. Bring a drink, a chair and something to share. All racers, for both slalom and the downriver races, register, check-in and pick up their racing bibs. The slalom course is open all day for practice runs. The downriver race is held mid day starting from Electra beach about a mile upstream of the slalom course. There is downriver pre-race meeting down on the sand at the water's edge before the race starts. 10:00am to 4:00pm Onsite registration and race bib pickup. No registration on Sunday. 12:30pm to 1:00pm Downriver racers shuttle themselves, gear and boats to the Electra beach put-in. 1:00pm to 1:15pm Required downriver race meeting at the Electra beach put-in. 1:15pm to ~2:00pm Downriver race. Slalom race day! It starts out with a brief pre-race meeting down by the put-in beach where we go over how the day will run. The slalom races run all day with every racer getting two runs down the course for each class that they are registered in. After the last racer finishes the course is taken down and we wrap up the weekend with an awards ceremony. 9:00am to 9:15am Required pre-race meeting for all slalom racers. After last racer Take down slalom course. After course is down Award ceremony. To join us at the races you can either register in person on the Saturday of race weekend or pre-register online. Your entry fee covers the entire weekend's activities, including slalom practice, the downriver race and whatever slalom events you enter as well as event insurance from the American Canoe Associate (ACA). The money brought in from the races covers the costs of putting on the races and helps support the club and the annual donations we make to a variety of river and paddling related causes. It's $20 for all the weekend's activities if payed online and $25 if you pay at the registration desk on the Saturday of the event. It is very helpful to the organizers if you pre-register online using the link below. If you are an American Canoe Association (ACA) member you'll receive a $5 discount rather than your registration fee covering ACA event insurance. If you'd like to join the ACA click here, select one of the Paddle America Club options and choose Loma Prieta Paddlers as the club. Registration is first come, first served and is limited to about 100 racers; which is the number of boaters we can reasonably get down the slalom course during the day. This is one of the bigger kayak races in California and in past years we've had between 45 and 80 racers. All racers must register or check-in and pick up their race bib on Saturday. There is no registration for the races on Sunday (slalom race day). Please remember to return your race bib after your last race so we can use them again next year. To pre-register, click this button and you'll be taken to the EventBrite online registration site where you can fill out the registration form and pay with your credit card. When you show up at the races stop by the registration table on Saturday to pick up your racing bib and turn in or sign the liability waivers. Link to PDF Adult Registration Form. Link to PDF Minor Registration Form. The races are entirely supported by registration fees and are not a corporate sponsored event. In lieu of large cash prizes the winners get the applause and admiration of their fellow paddlers, along with a stylish ribbon. 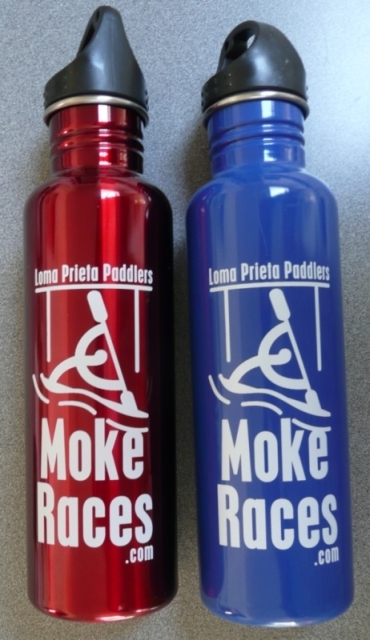 We also have these nifty stainless steel water bottles for the first three finishers in each class. If you would like to help sponser the Moke Races through a gift of cash or merchandise, please contact us. The weather in late September or early October can range from sunny and hot to cool, with a slight chance of rain. The water on the Mokelumne is dam fed and is a bit on the cool side, even when the days are hot. There	are no concessions at	the races and no	drinking water available along the river corridor. The nearest stores are back down the Electra road and then north on Hwy 49 into Jackson. We recommend you bring enough to eat and drink for each day. Trash cans will be set up near the slalom course and there are pit toilets available at several points along the river. Depending on your judging station folding chairs, sun umbrellas, a tarp, rope and plenty of sun screen can be a good idea. Each judging station needs a throw rope and a whistle. If you have these items, please bring them along and while you're at it put in your personal first aid kit. You'll of course need your boating gear which must include your PFD, helmet and float bags. Feel free to bring your own fans and cheering section. If you have non-boaters who'd like to help out at the races please let us know. We always can use an extra hand. 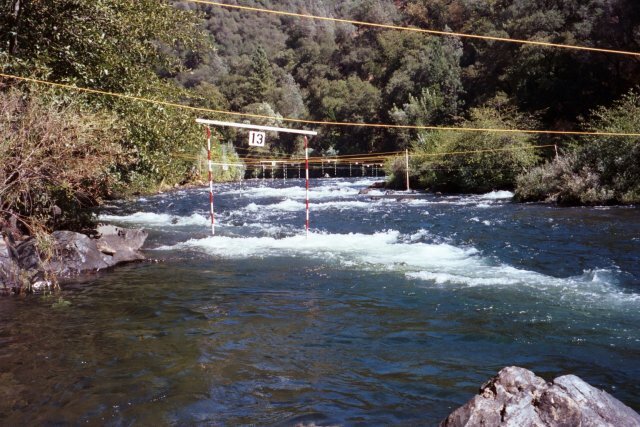 The races are held on a class II section of the Mokelumne River. Participants must the have river skills and experience for this difficulty of river. If you have never boated on this section of the Mokelumne River we recommend that you take an opportunity to paddle the Electra run before the races to familiarize yourself with the river and it's rapids. All participants are required to have an approved PFD, helmet and float bags in order to race or practice on the course. All participants are required to help any boater requiring aid. During the downriver race there may be times when you are paddling in a large group of boats and other times when you may be out of sight of other boaters. Two sweep boaters will follow the last racers down the course. We will also have a safety boaters stationed at each of the two largest rapids on the run, "The Slot" and "S-Turn". The slalom race course will have throw bags stationed at each judging station. There will also be two racers in the water at all times at the end of the slalom course to lend assistance if required. In the event that medical attention is required Sutter Hospital is located in the town of Jackson a short distance away. A medical professional will not be on location at the races. Loma Prieta Paddlers has also put together a brief river safety plan for the Mokelumne River. There are several campgrounds near the town of Jackson such as Indian Grinding Rock State Park, Gold Country Campground, New Hogan Lake and Lake Camanche. There is no camping allowed along the Mokelumne River itself. The nearby gold rush town of Jackson has many hotels to choose from. Here's a Google Map showing the river and a few of the common places to stay and eat in Jackson. We can always use an extra hand so if you or non-boating significant others would like to volunteer to help out at the races please contact us.